In an anti-movement can be found, in perverted fashion, those demands which a movement could have pursued – the call for justice, equality, dignity, respect and ultimately a brighter future. 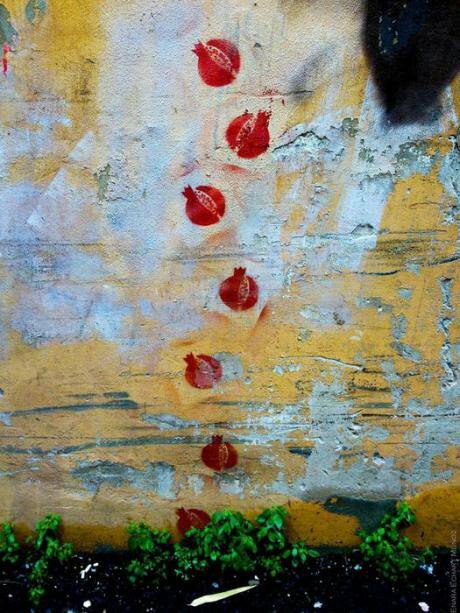 Bombs falling (graffiti on a wall of Beirut, Lebanon). Enara Echart Munõz. All rights reserved.What we call “terrorism,” a concept which requires clarification, has in the span of half a century shifted from one configuration to another. From the late 1960s up till the end of the 1980s, its analysis fell under “methodological nationalism,” to use the words of late lamented sociologist Ulrich Beck. The phenomenon was essentially inscribed within the nation-state, or the interaction between them – so-called international relations. Internally, it applied mostly to the extreme right (of Fascist bent, for example), the extreme left (especially Italy and Germany) or to regional separatist movements (as in Ireland or the Basque country). Internationally, it stood first and foremost for the Palestinian cause. At the time, this form of conceptualizing the term clashed with non-scientific usages. It was not uncommon for an article or conference to start with a few caveats concerning the possibility of advancing a satisfactory definition of terrorism, as one person’s freedom fighter could be another’s rebel. The Cold War did not make it any easier to find an acceptable legal definition at the international level. At the United Nations, it was difficult to find common ground between the representatives of these two poles, as in the case of figuring out whether to speak of terrorism regarding the extreme acts of violence carried out in the name of the Palestinian nation. In this context, from the sociological point of view, I proposed in The Making of Terrorism a conceptualization in which the phenomenon could be cast in two lights. On one hand, terrorism is an instrumental action, a resource mobilized by actors to achieve certain means - calculations are made, strategies outlined, and the reasonable means are considered even if often the cost of the actions is disproportional to the results accomplished. On the other hand, it could imply the loss of direction, a more or less advanced decoupling between the perpetrator of violence and the class, people or nation the terrorist purports to represent. In this case, terrorism seems all the more violent and unstoppable as the perpetrator loses the recognition of those he claims to embody. He speaks the language of guns and explosives while those he claims to represent, the movement of which he deems himself the highest expression, cannot recognize itself at all in his actions. His discourse is artificial. He acts according to what I call an inversion of the national or social movement, whose meaning the terrorists perverts. Instrumentality and loss of meaning/direction were thus the two pillars of a sociological definition of terrorism. However, in the 1980s a deep mutation occurred. Terrorists of yesteryear became enfeebled, broke down or simply disappeared, leaving room eventually for other forms of action. This ushered in the era of global terrorism, inaugurated in the wake of the Iranian Revolution with the 1982 attacks in Lebanon. Terrorist action could no longer be pigeonholed in the framework of the nation-state and international relations. It was to a certain extent also meta-political, religious, with its references to the Ummah and Jihad. Its scope was global, boundless. The instrumental dimension of action became hard to define. When terrorists start giving their lives and killing at the same time, the cost-benefit equation becomes problematic if the question is how to consider the value of the life of a man. However, such actions could make sense in the eyes of many in the world, and remarkably so among Arab and Muslim populations, sensitive to the virulent anti-western and anti-Semitic motivations of terrorists. Global terrorism peaked with the acts of September 11, 2011. The perpetrators were not from American soil. The meaning with which they imbued their actions was religious and anti-western. They exhibited great rationality in the practical feat: they purchased business class tickets to endow them with greater respectability, and employed simple cutters as weapons; they outdid the analyses of sophisticated anti-terrorism specialists in Washington. Al Qaeda’s terrorism was structured in a pyramid shape, as in the previous era. However with the idea of “sleeper networks” and untethered localized actors capable of acting without orders or instructions, a new element of global terrorism was shaped. Terrorism could be carried out by actors that do not require a chain of command to act locally, while conferring a general, global meaning to their actions. After 9/11 global terrorism diversified into three main directions. The first is exemplified by the spectacular attacks in Madrid (2004), London (2005), Casablanca, Bali and Istanbul. These attacks were the feats of people who lived in said counties, but who did not seem to espouse a political project other than expressing hatred and resentment. They felt as if they had no place in society and were not sheltered by the State, whether in the UK, Spain or anywhere else. Then there are the terrorists acts that have been classified, usually too hastily, as “lone wolves.” The perpetrators of these attacks and killings acted in isolation, either alone or in pairs. The extreme violence employed seems unhinged from organization. It is hyper-located but at the time its meaning inscribes it in global and meta-political logics of radical Islam or other struggles, as in Norway with far right-extremist Anton Breivik. This notion of “lone wolves” must be qualified. The police and court investigations many times indicate that behind these killers there are online networks, but also face-to-face encounters with other actors of radical Islam, prison relationships, meeting in the Middle East or in European mosques, etc. Finally, the third logic at work in this new era of global terrorism is the construction of quasi states, such as Daesh or Boko Haram, and the attempt to impose through internal and external violence, to be sure, but also in fostering local forms of social life. Islamic terrorism has thus diversified, but it is surely global, since its meaning is global and because even very localized actions are inscribed in a globalized symbolic dimension and imaginary. And it is the type of menace that could materialize anywhere in the world, because it is not something that can be carried out by a few exalted extremists. It makes sense to many, even if only a few cross the threshold between words and deeds. What lies at the heart? To approach this question, one must start from two sets of conclusions. The first one refers to what lies at the heart of Islamist discourse: hatred of the west (and Jews). The second comes from the world of those who, like Farhad Khosrokhavar, have studied the trajectories of terrorists, where they find that in the beginning there is a loss of meaning, the feeling of an existential void, the consciousness that all reference points for the construction of the self are absent. This loss leads in turn to failures, to gaps that are individual but also global, since they are found in many societies where Muslims live, but also other groups that have helped to draw up the image of contemporary radical Islam. And such people seek a resolution in the absoluteness of meaning, the references that lead to radical Islam. The sources of de-subjectivization are multiple. In France, for example, many insist upon economic crisis, the hardships of the banlieues, the drama of failed integration, the deficits of the educational system, or the break down of families. Overall and without exception, these reasons allude to failures of the west, in particular its responsibilities for decolonization and its failure to enter a post-classic modernity. In other historical and social contexts, loss and absence are inscribed in social relations that are draped in conflict, and supported by a collective action that is similar to a social, political, cultural movement. But among us, such conflict-ridden relationships have not developed. Rather, non-relationships were established, something that is particularly dramatic, a veritable violent rupture, such that there is no common ground for dialogue or negotiation. As a result, what could have become a movement becomes its inverse, an anti-movement, where it is possible to find, in perverted fashion, those demands which the movement could have pursued - a call for justice, equality, dignity, respect and ultimately a brighter future. This anti-movement is as global as other contemporary movements, which often act locally but are inscribed symbolically, imaginatively and eventually concretely within a global meaning. The anti-movement is the opposite of this: rupture is non-debate, violence and the refusal to negotiate; inextinguishable hatred of the other, considered as an enemy to be eliminated rather than as an adversary.